Two students from the Robert Morris University School of Culinary Arts in Chicago were selected by Italian chefs to participate in a culinary competition in Rimini, Italy. Making the cut for a student competition against difficult odds is an achievement in itself. When the odds are 11 out of 300, those who find themselves in the elite eleven also face a significant amount of pressure to succeed. Robert Morris University (RMU) culinary students Ethan Zuk of Highland, Michigan and Morgan Nash from Aurora, Illinois will be facing such pressure when they participate in the World Association of Culinary Societies (WACS) and the Federazione Italiana Cuochi (Italian Chefs Federation, FIC) Campionati della Cucina Italiana 2018 in Rimini, Italy, February 12 through the 19th. They are two of eleven students from several different countries who will be competing against professional cooks and chefs in two events of the competition. The “Campionati” (or championships) is part of larger food festival which draws attendance from around the world. This year’s event includes contests in hot and cold preparation, pastry, pastry art, confectionary for restaurants, live demonstrations, timed food preparation and best student recognition. The students will arrive in Florence on February 12, go through orientation and prepare for the competition under the direction of Chef Hindsley and three Italian chefs at Apicius. They will drive to Rimini on February 19 for the event. Both Ethan and Morgan will compete in the “cold competition” and Morgan will participate in an additional event, pastry art, which is a contest that features creating sculpture with chocolate. Presently, Ethan works part time at Tiki Terrace in DesPlaines, IL. He aims to get as much experience at different restaurants in the Chicago area and eventually run his own fine dining restaurant kitchen. Morgan works at The Art Institute for Bon Appetit Management and she hopes to travel after college, getting experience in the world of pastry, and eventually managing her own pastry team. 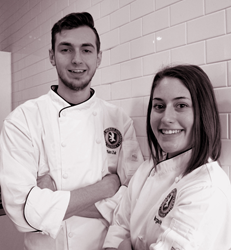 The students and chefs of the Robert Morris University School of Culinary Arts are planning an enthusiastic send off for Ethan and Morgan on February 6 at 9:30 a.m. in the RMU dining room.